Vienna, January 25th 2017 – Noctua today officially announced that it will provide users of its CPU coolers with free mounting upgrade kits for the new AM4 socket of AMD’s upcoming Ryzen architecture. The SecuFirm2™ mounting-kits are backwards compatible with most Noctua CPU coolers manufactured since 2005 and will be available via resellers and free of charge via Noctua’s website after uploading a proof of purchase. 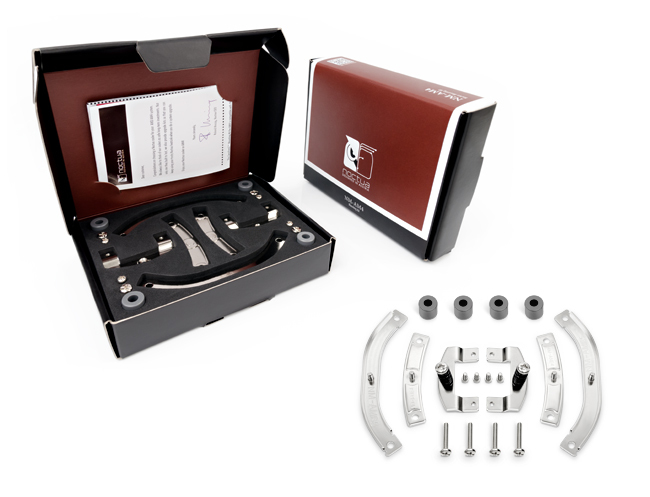 Noctua will offer two different SecuFirm2™ mounting upgrade kits for AM4: the NM-AM4-UxS kit for NH-U14S, NH-U12S and NH-U9S, and the NM-AM4 kit that supports most other retail cooler models manufactured since 2005 (NH-C12P, NH-C12P SE14, NH-C14, NH-C14S, NH-D14, NH-D14 SE2011, NH-D15, NH-D15S, NH-D9L, NH-L12, NH-L9x65, NH-U12, NH-U12F, NH-U12P, NH-U12P, SE1366, NH-U12P SE2, NH-U9, NH-U9B, NH-U9B SE2, NH-U9F) except for the NH-L9i/NH-L9a series low-profile coolers. In addition to the NM-AM4 and NM-AM4-UxS, Noctua also aims to offer an upgrade-kit for the NH-L9a later this year. The SecuFirm2™ mounting system for AM4 has been tailor-designed for the new socket in order to ensure optimal compatibility, perfect contact pressure and easy, straightforward installation. Both the NM-AM4 and the NM-AM4-UxS kit include two different sets of mounting bars, which allows the users to choose the orientation of the cooler according to their preferences in order to ensure an optimal alignment with the airflow path inside the case. In order to obtain the kits free of charge via Noctua’s website, users are required to upload a proof of purchase (electronic version, scan or photo of the invoice) of an AM4 motherboard or AM4 CPU as well as an eligible Noctua retail CPU cooler (server and workstation coolers of the DX and DO line are excluded from the free offer). Users who have lost the invoice for their Noctua cooler may write their full name and the current date on a piece of paper, take a photo of the paper next to their cooler and upload it as proof of purchase. Depending on the user’s location, shipping will usually take 1–4 weeks. For users who need the kit urgently or do not yet have a proof of purchase of an AM4 CPU or motherboard, the NM-AM4 and NM-AM4-UxS kits will also be available via selected retailers and e-tailers such as Amazon at a suggested retail price of EUR 7.90/USD 7.90. Designed in Austria, Noctua's premium cooling components are internationally renowned for their superb quietness, exceptional performance and thoroughgoing quality. Having received more than 6000 awards and recommendations from leading hardware websites and magazines, Noctua's fans and heatsinks are serving hundreds of thousands of satisfied customers around the globe.